For other uses, see Lozova (disambiguation). 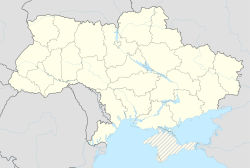 Lozova is the 2nd largest city in Kharkiv Oblast after Kharkiv in terms of population. The city was evacuated on August 27, 2008 due to a fire in a military warehouse. However, there were no serious casualties or deaths. Lozova is a main rail hub within the Kharkiv Oblast. The City is divided into two main parts, one is called Gorod and other one is called Raion. ^ Rapoport, Anatol. Conceptions of World Order: Building Peace in the Third Millennium (PDF). Institute for Conflict Analysis and Resolution. Archived from the original (PDF) on 29 May 2015. Retrieved 23 February 2015. This article about a location in Kharkiv Oblast is a stub. You can help Wikipedia by expanding it. This page was last edited on 17 February 2018, at 11:36 (UTC).